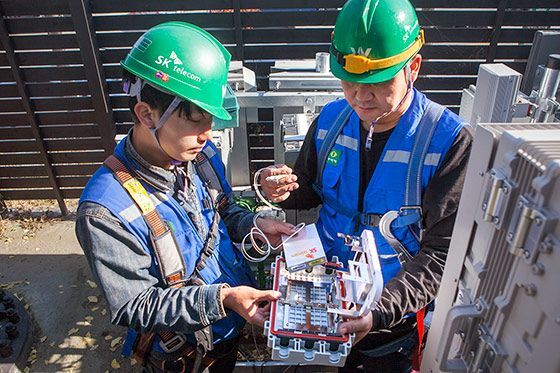 SK Telecom (NYSE: SKM) today announced that it successfully deployed 5G-PON(Passive Optical Network), next generation technology for distribution networks, that can deliver both LTE and 5G communications services. The mobile communications network is a collection of interconnected networks throughout the country. Distribution networks refer to networks connecting base stations with remote units and antennas installed at the premises. Unlike the conventional distribution networks, where different types of network are required for 3G, LTE and broadband access, 5G-PON solution delivers multiple communications services using a single network. The solution will facilitate the process of delivering a broader coverage for the 5G rollout by simply installing base stations and antennas without additional networks. Also, it requires smaller devices and equipment than the existing distribution technology and operates without additional power supply. The conventional device need to be installed inside the premises for power supply. 5G-PON solution, however, can be built in outdoor settings as it requires no power supply, delivering a higher level of satisfaction to the premises. In addition, the solution can be constructed in a protected ring architecture. Therefore, even if a line is disconnected, the communications services are delivered seamlessly using the other line. SK Telecom will roll out 5G-PON service in 85 areas nationwide including Seoul, Busan, Daegu, Daejeon and Gwangju, and expand the deployment further ahead. It particularly expects that the quality of service will get improved in rural areas thanks to the easier deployment of 5G-PON. The solution is the result of SK Telecom’s collaboration with local vendors, such as Solid, HFR, SunwaveTec and Coweaver, which have strong capabilities in optical communications technology. SK Telecom will propose the solution to the 5G network standards of the ITU-T.